Alongside release of Mac OS X Lion and new MacBook Airs, Apple introduced slightly changed keyboards. The main change is that Apple has replaced now the the Dashboard key (located on the F4) with a Launchpad key. 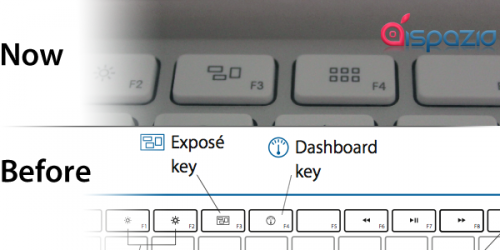 The other one is that the icon of the Exposé button (located on the F3) key that is now used for Mission Control in Lion was a little bit changed. Such changes are now implemented only in wired keyboard, but we presume they will soon make their way to the Apple wireless keyboard and keyboards with purchased iMac’s and Mac Pros. Unfortunately, this time Apple has not implemented the rumored backlit keys as well as significant design changes. Today Engadget found a video that suggests a white iPhone 4 might get a new Expose-style multitasking interface. We can see the application is complete and it works very well. The next step is to improve the graphics and, finally, develop a caching system. A nice example of how multitasking can be implemented. What do you think? Here is a new concept video showing Exposé in action on the iPhone. Through the Home button we can see all the different windows of the springboard and move quickly with a single click. What do you think?